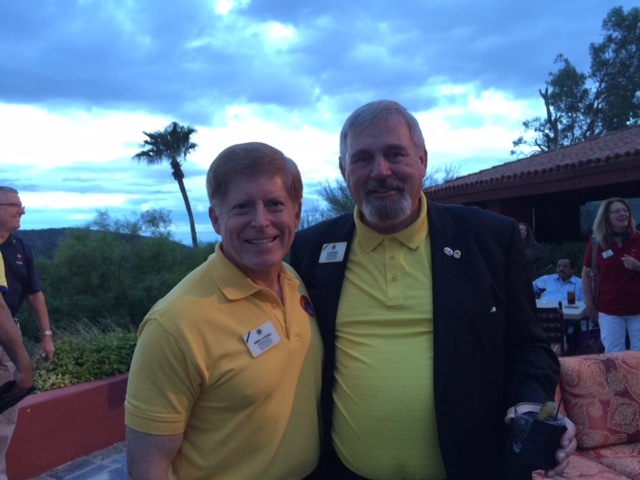 During the past week, the Lions Clubs International Board of Directors met in Scottsdale, Arizona, USA to conduct its fall meeting. 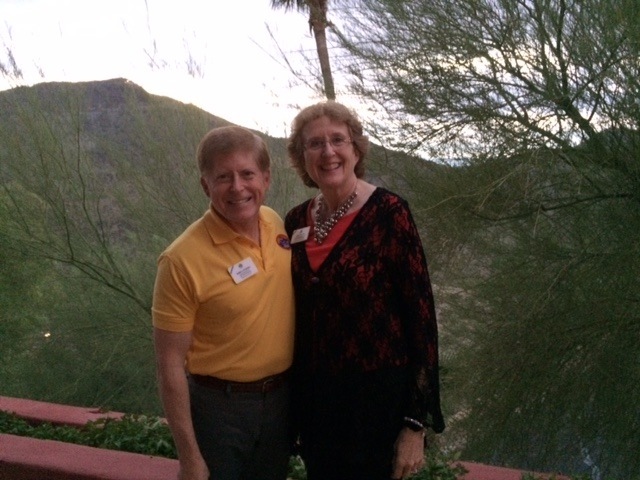 The Arizona Lions of Multiple District 21 were the official hosts and we were treated to a world-class experience. I cannot do justice in one blog entry to everything that occurred. However, I will focus on a few major experiences that stand out in my mind and hope to include more information about the events at the meeting in future entries. 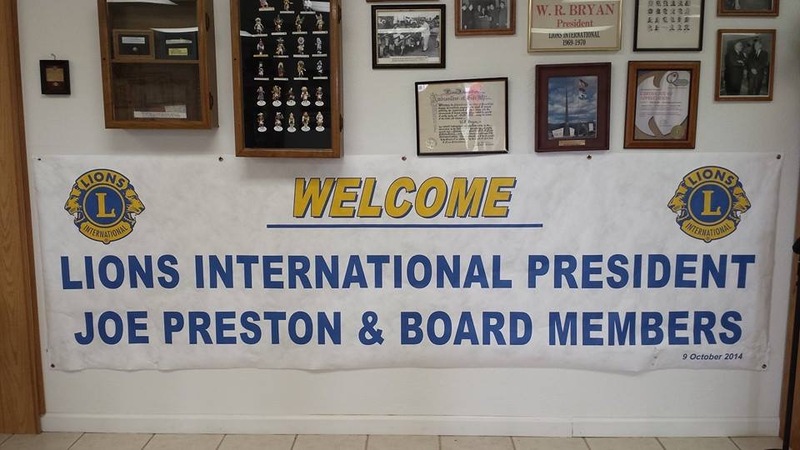 To begin, the success of the meeting must be credited, in large part, to the inspiration of our International President Joe Preston. This year, he and the executive officers have laid out a proactive, progressive, and positive agenda that is club-focused and provides straightforward strategies to “strengthen the pride” for Lions in 2014-15 and beyond. He and his wife, Joni, worked with the local hosts to plan a wonderful experience for their international guests. Many thanks to them for making the event so memorable. Our stay at the Phoenician Resort Hotel was wonderful. The view from our balcony provides a clue about the resort. The weather was beautiful and even though some occasional showers, we had plenty of blue skies and sunshine as we charged our batteries for the upcoming winter in North Dakota. 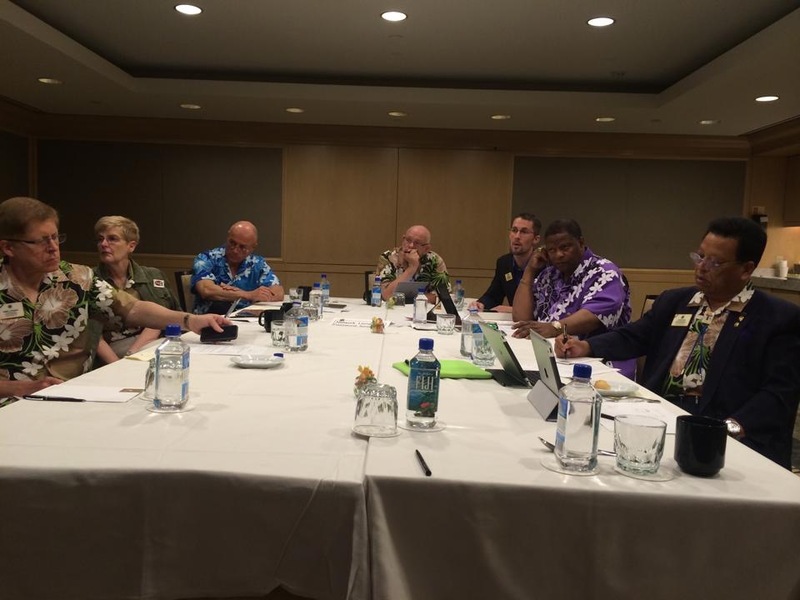 The official meetings took place in the ballroom of the Phoenician Resort Hotel where a gallery of board spouses and companions, as well as local Lion leaders and guests could observe. I walked among them before the meeting, thanking them for their service and hospitality. Their pride in hosting an international board meeting was quite apparent. I also met representatives from the Arizona State University Campus Club and encouraged them to be bold and make a difference on their campus and in the community. At the appointed time, President Preston entered the chambers and took his place at the head of the assembly. The opening session is quite formal and protocol is followed with precision. In addition to the initial business, President Preston presented progressive Melvin Jones Fellow recognitions to several board members (including ID Ed Farrington at the far right in the photo above); and to highlight the importance of asking and retaining new members, the President awarded five international directors who had sponsored and retained new members for two years with membership keys: five members pin (ID Karla Harris–center of the above photo–and ID Bill McKinney), ten members pin (ID Kembra Smith and ID Robert Littlefield), and fifteen members pin (ID Larry Dicus). As directors, we spent two and one half days working in our committees. There are eight major committees and as a member of the Public Relations Committee, I was involved in discussions pertaining to all aspects of our internal and external public relations efforts, including: our Centennial planning and activities, public relations grants, the Lions magazine, protocol, and awards. The specifics of our deliberations will be the subject of future blogs once the official minutes of the meeting are published. But suffice to say, when you have representatives from around the world working together to formulate policy and make recommendations, it encourages intense and passionate discussion within the context of respect for the opinions of others and the need to collaborate to develop the best course of action for nearly 1.4 million Lions around the world. Imagine the level of interaction when our committee met with Budget and Finance Committee: There are six interpreters, along with 12 board members and staff, working together to ask and answer questions, as well as make decisions affecting the future of our association! It was a very memorable experience. Once the committees completed their deliberations, the minutes and resolutions from each committee were published for all board members to review and prepare for the informal hearings. What is known as “Report Night” involved reading hundreds of pages of information and preparing questions to be asked at the hearings the following morning. What I found without exception was the high level of esteem in which every member of the board was held by the other directors. In order to move forward, every member had to respect the preliminary work of others to develop the best courses of action for the association. When the final meeting was held, each committee made its report and moved acceptance of its resolutions (as modified through the hearing process). Pictured here are members of the Public Relations committee (from right to left): ID Alexis Vincent Gomes (Republic of Congo), chair; ID Byung-Gi Kim (Republic of Korea), vice chair; ID Linda Tincher (USA), and ID Robert Littlefield (USA). Not pictured: PDG Alan Lundgren (USA). The recommendations from the board action that affect LCI as a whole will be proposed for consideration and approval by the delegates at the international convention next June in Honolulu, Hawaii. After fairly intense days of committee work and hearings, the local hosts had a variety of special events for the board members and their spouses/companions to enjoy. 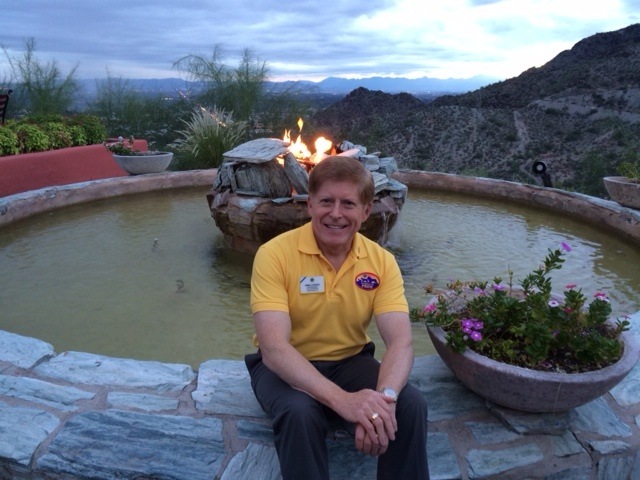 Some highlights for Kathy and me included the dinner and tour at the Heard Museum, the host “western” night at the Rockin’ R Ranch, the final dinner at Different Point of View Restaurant, and the trip to the Melvin Jones Memorial in Fort Thomas, Arizona. On the evening of the first day, the board traveled to the Heard Museum in Phoenix for a special dinner and tour of the museum. 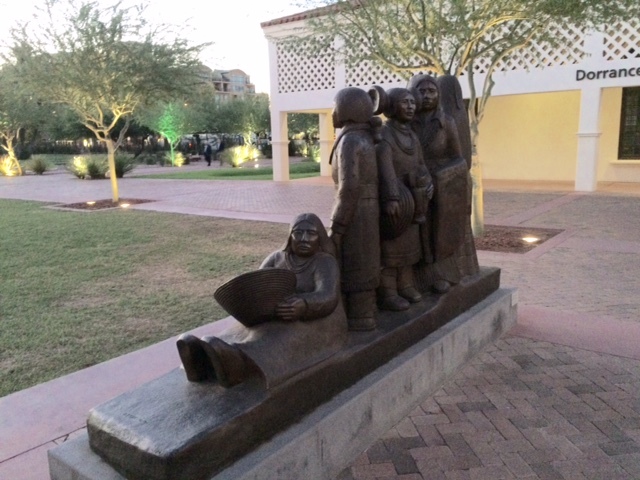 The mission of the Heard Museum is to educate visitors and promote greater public understanding of the arts, heritage and life ways of the indigenous peoples of the Americas, with an emphasis on American Indian tribes and other cultures of the Southwest. The Museum also houses the American Indian Veterans National Memorial. 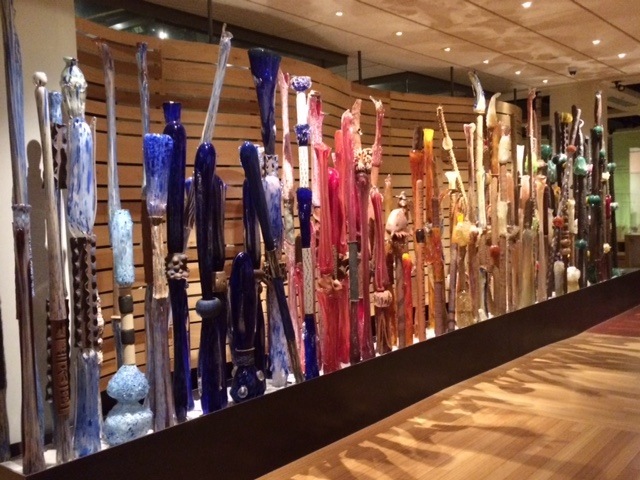 The collection at the museum is impressive in its presentation and magnitude. 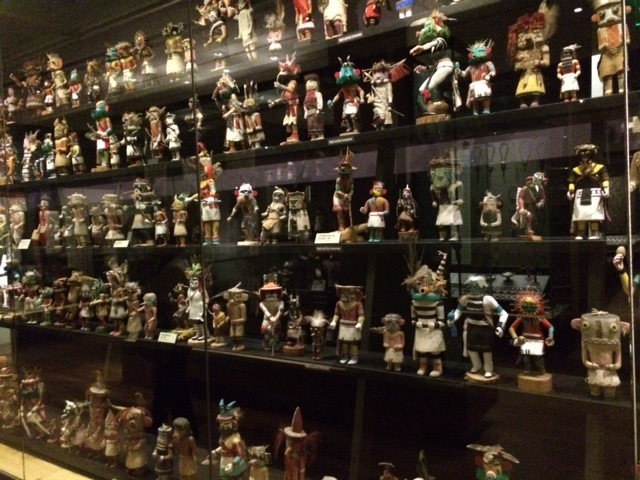 The grounds are filled with sculptures, the museum with priceless collections, including the katsina dolls and the art fence whose meaning is not fully known, but could depict the seasons of the year or the passage of a day. 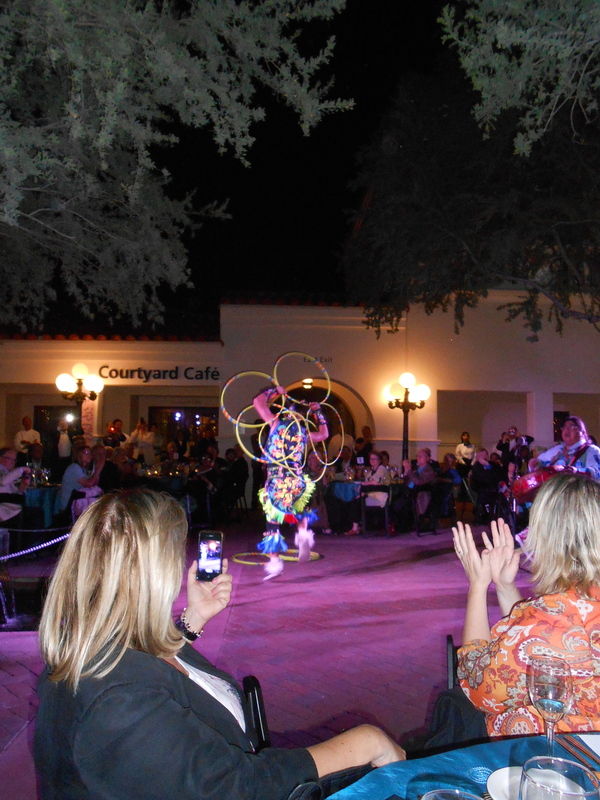 After having an opportunity to tour the museum, we enjoyed a wonderful meal and were entertained by local musicians and the performance of a hoop dancer who is currently ranked #5 in the world. 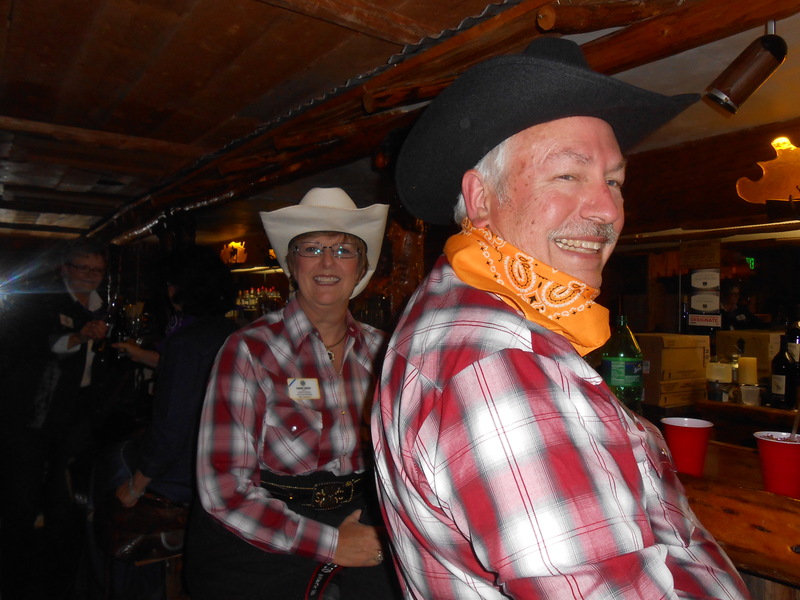 Host night at the Rockin ‘R Ranch provided the board members with the opportunity to dress in western attire and enjoy some great chuck wagon food. 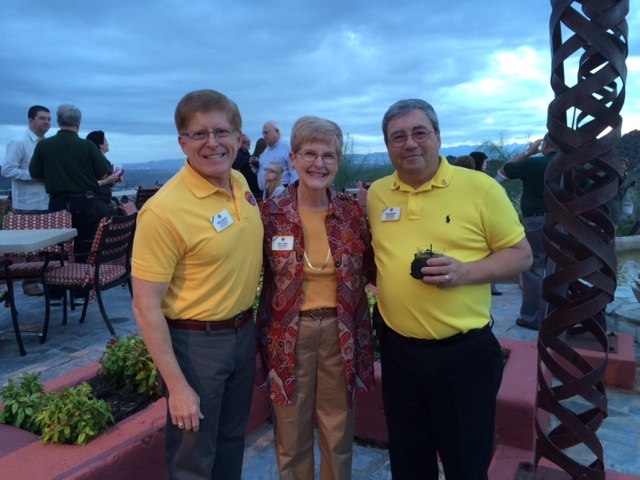 Kathy and I got into the spirit of the event, as did our 2nd International VP Bob Corlew and his wife, Diane. 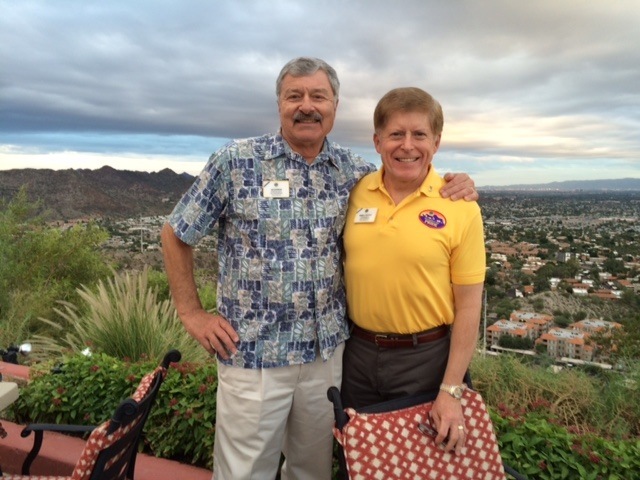 The local hosts were so proud to have the international board present and what seemed like over one hundred local Arizona Lion leaders and guests were present, including our MD5 snowbird PDG Jan Wagner. The performers included the top fiddler in the country, along with the charming vocalists (the Robson’s) and the special performance of their daughter, Marisa Robson who joined them and “signed” one of the songs (see http://www.eastvalleytribune.com/article_bc5479c0-17e8-57b4-8890-283deb7ac2b6.html for more about this remarkable young woman). What was especially significant about the event was the installation of four new clubs–three of which were campus clubs–and the induction of nearly 90 new members at the event. Having the international executive officers and the entire board of directors at the installation was historic and the new campus club members were so inspired that their enthusiasm was overwhelming. What an honor to be part of that event. 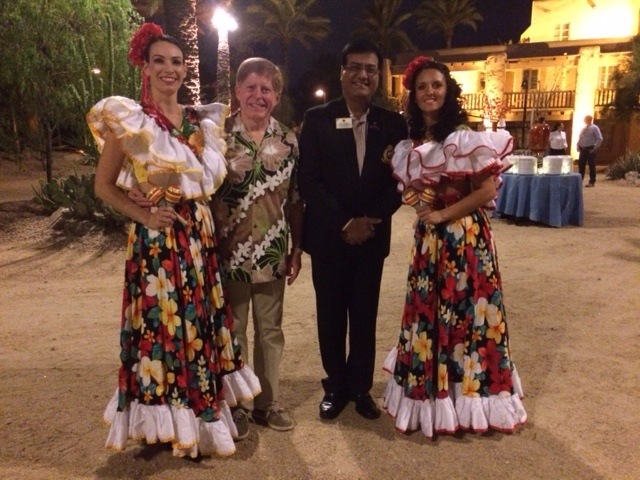 On Tuesday night, we enjoyed a Mexican-themed evening on the site of the Phoenician Resort Hotel. 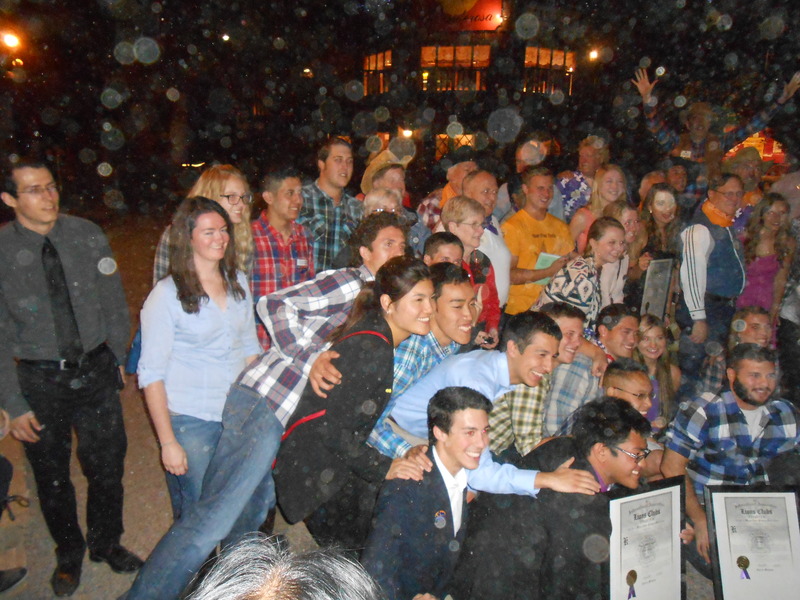 We enjoyed the music of mariachi performers and took time to meet many of them. Pictured here with me is ID Raju Manwani of India. 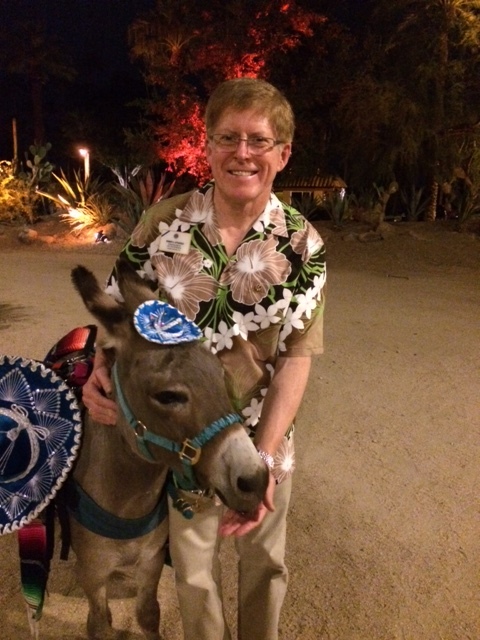 The beverages were delivered by friendly mules. But the festivities did not last for long due to the reading material we had waiting for us to review upon returning to our rooms for the evening. The final board dinner took place at Different Point of View Restaurant. The location of the restaurant was at the top of a cliff and the view was spectacular. The entertainment for the evening was a Dueling Piano Team. After a very productive week, we really enjoyed singing and dancing and celebrating our strengthening friendships and common bond of service to the world. 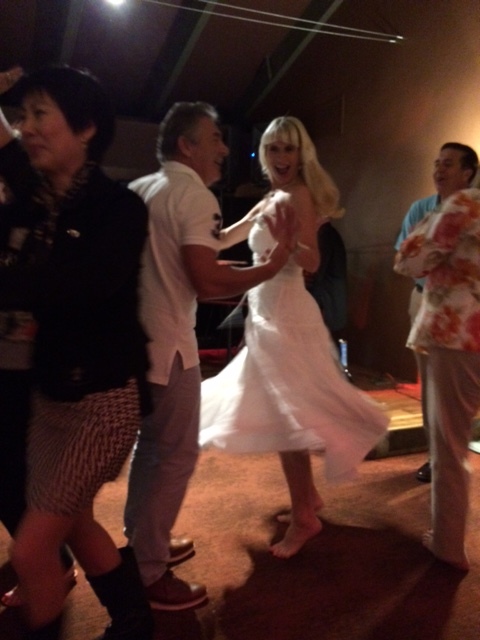 Among the best dancers were our Norwegian friends, ID Svein Oystein Berntsen and his wife Hanna. 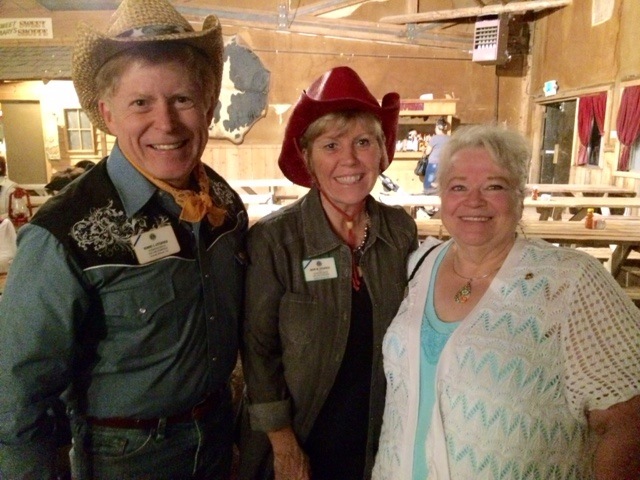 What continues to remain as the most positive of outcomes from our involvement on the board is the growing bond of friendship Kathy and I are experiencing with our fellow board members and LCI staff. I am so proud to be included among the first year director class from the United States. Each of us brings our own leadership traits to the board, but when we get together, there is a wonderful synergy that results. We enjoy each other’s company, respect each others’ points of view, and help each other to be the best representatives we can be for the Lions we serve. We come from across the country–Washington, Nevada, North Dakota, Wisconsin, Indiana, New Hampshire, and Georgia–geographically bringing our perspectives to the table. We represent diversity and bring share our views openly with each other. I am pleased that all of these directors will be coming to Multiple District 5 during the 2014-15 year as international guests. Another dimension of our time together was the formation of an ID Chorus. This year, the musicality of our International President inspired me to suggest that we create a chorus to perform at our board meetings. ID Cindy Gregg from Pennsylvania provided excellent accompaniment and directors from around the world participated. 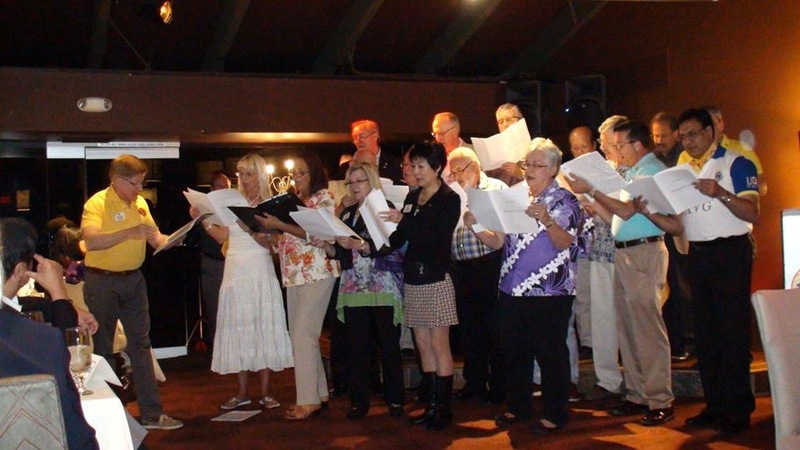 We sang “Imagine” by John Lennon in honor of Past President Barry Palmer, “Strengthen the Pride” by Joe Preston in his honor, and “Happy Trails” by Dale Evans and Roy Rogers in honor of the local hosts from Arizona who staged such a wonderful experience for the board. 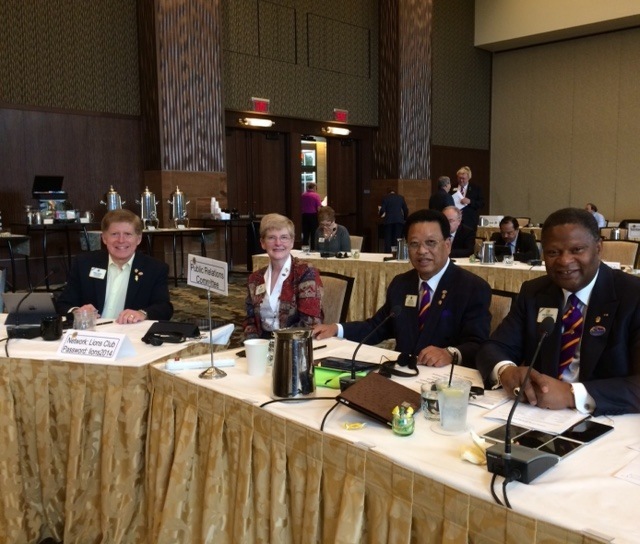 We plan to continue the group at our spring board meeting in Prague, and may perform again in Honolulu. It was great fun. 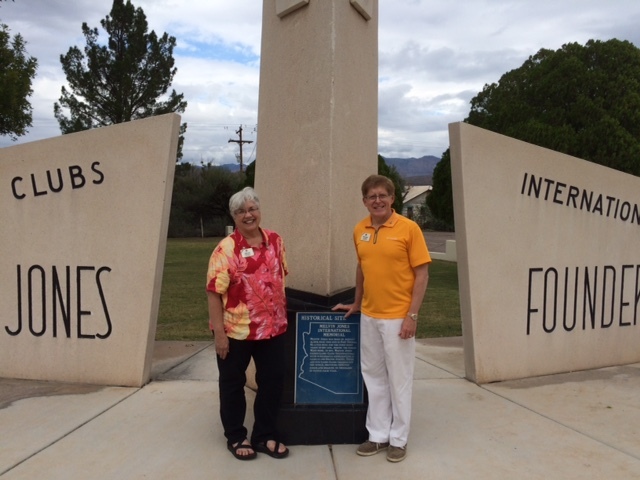 As our final event, members of the board were invited to tour the Melvin Jones Memorial in Fort Thomas, Arizona. 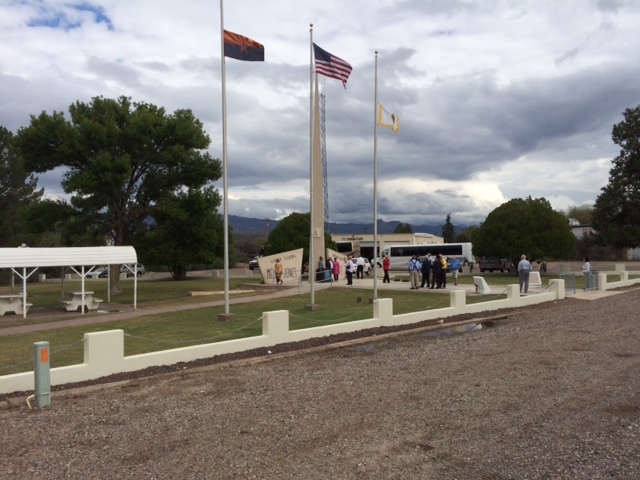 The local Safford Lions Club hosted a meal for the board and provided a tour of the memorial and museum. Melvin Jones was born in Fort Thomas and wanted his memorial to be located there. The memorial was dedicated in 1965 and through the support of Lions from around the world, the museum was built and has been maintained. 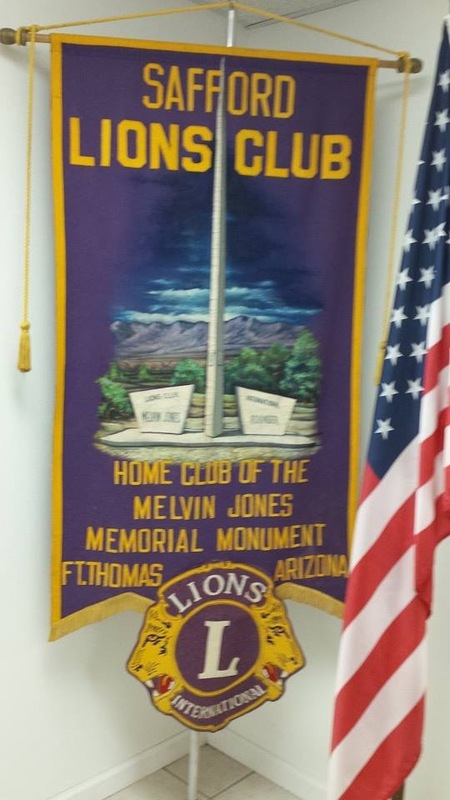 The Melvin Jones Lions International Memorial is a 501c3 corporation and benefactors interested in becoming one of the first one thousand individuals who contribute $1,000 US will be named Vanguards. 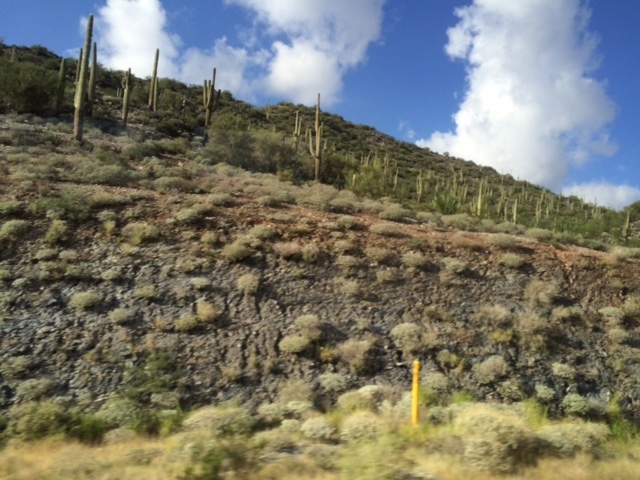 On the ride back to Phoenix, the beauty of the Arizona scenery was captivating. But thoughts of home and the North Dakota State Lions Convention next weekend brought me back to reality after what was a remarkable and memorable experience. Thank you — your musings really bring home the work of our International Board.